I have fallen in love with oat bran. Why? Learn the health benefits of Oat Bran and how to make this lovely vegan breakfast recipe for PB&J Oat Bran! I have fallen in love with oat bran. Ever since making my banana cream pie parfaits, I couldn’t believe where it was I was hiding that I haven’t tried oat bran before. 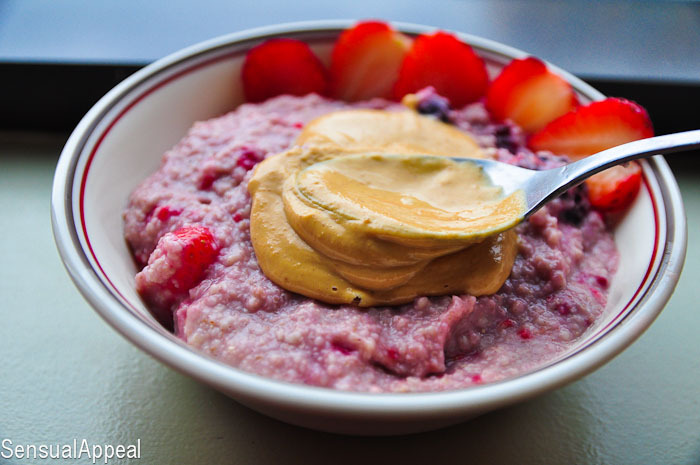 It’s consistency is so deliciously creamy… plus the whole thing expands so much, making you actually feel like you’re eating a lot (unlike rolled oats, which don’t expand very much, imo). After doing some research online, the basic info I found out about oat bran is that.. Whole grains have a high dietary fiber content, but oat bran provides more than rolled oats. A 100-gram serving of dry oat bran contains just over 15 grams of fiber, while rolled oats provide 10 grams. Fiber improves cholesterol levels, regulates blood sugar and also helps to fill you up. Oat bran provides much more protein and a wee bit less carbs than rolled oats. A 100-gram serving of oat bran contains about 17 grams of protein and 66 grams of carbs. This same serving size of rolled oats contains about 13 grams of protein and 68 grams of carbs. Oat bran and rolled oats have moderate amounts of total far, but both are low in dangerous saturated fat, which is known to cause heart disease. A 100-gram serving of oat bran has 7 grams of total fat and just under 1.5 grams of saturated fat. Rolled oats contain about 6.5 grams of total fat and just over 1 gram of saturated. Oat bran is higher in B vitamins than rolled oats. A 100-gram serving of oat bran contains 78 percent of the daily value of thiamin, 15 percent of pantothenic acid and 13 percent of riboflavin. The most notable B vitamin in rolled oats is niacin — a 100-gram serving contains 1.1 milligrams. B vitamins play a key role in the breakdown of macronutrients for energy. They are also vital for red blood formation and nervous system function. Oat bran has a higher iron content than rolled oats. A 100-gram serving of oat bran contains 30 percent of the recommended daily intake and this same serving of rolled oats contains about 13 percent. Iron is used for oxygen transportation in the system, and it also helps with energy production. 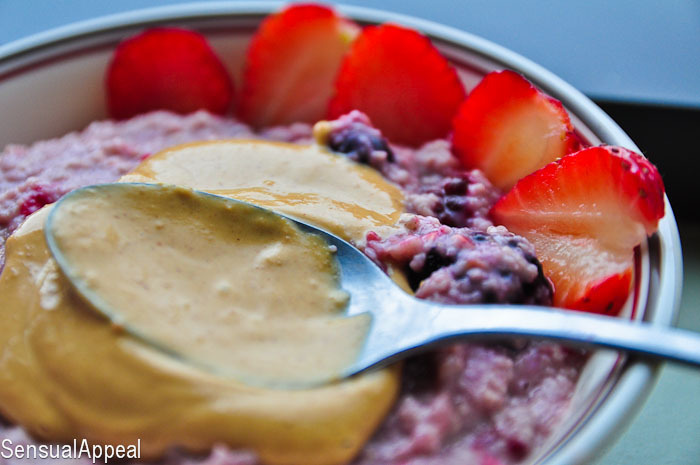 Now enjoy this delicious and healthy vegan breakfast recipe using oat bran as the star! What’s your favorite benefit of oat bran? Texture wise, you prefer oat bran, Old Fashioned Oats, or Steel Cut oats? Love it! I have used oat bran before for my oatmeal, and it tastes pretty much the same, since I top with a ton of healthy goodies. Love your post today, I never knew that information about oat bran Have a great weekend! I’ve never tried oat bran, but it looks like it’s the new oatmeal in the blogosphere and frankly, I think I’d like it better! I LOVE oat bran too! My perfect bowl of oats (that I eat at least 4 times a week) is 1/4 cup rolled oats + 2 TBS. oat bran. It’s the perfect mixture of chewy and creamy! Oooh thanks for the tip! I’ll try that out too 🙂 Do you cook it on the stovetop as well? I used to love oat bran! I even got into a more savory phase where I would top it with tahini and runny eggs. Super good – I promise! I dont have it much anymore because I am mostly Paleo and the whole lectin/antinutrient thing gets stuck in my head about it – but I know that come winter I will definitely still have my occasional bowl of oat bran! also, I read all your posts but I dont comment often – but i love your blog! I know how you feel; one day I tried oat bran and I’ve been addicted ever since. I buy a huuuge bag and store it in my freezer (not that I need to since I go through it so quickly, though!). Ohhh, is that where I’m supposed to store it? o.O I had no idea, I just put it in the cupboard. I just read it can go bad after a while so it’s good to keep it in a dark, cool place. Like I said, I doubt I need to keep it in the freezer since I go through it so fast, but I buy several pounds at a time. XD I’m sure you’re safe. Gotcha, thanks for clarifying! I heard that can happen with flaxmeal too, which I had no idea about and I had mine for like a year before throwing it out after I learned it goes rancid haha. Oops. I’ve never had oat bran before, but now i NEED to try it! I’m all about more iron and B vitamins,, it’s so hard for me to get those with my normal diet. Love the PB&J idea too! Yes! I take a Super B Complex vitamin but iron is another story and it’s not always easy to get that from foods and I don’t wanna overdo it with the iron either by taking a supplement. Who knew oat bran was this beneficial, right? That looks so delicious! I keep meaning to try oat bran, I really need to get some at the store this weekend! i have never had it but now I want to try it badly! oat bran is my favorite!!! i love how voluminous it can get! I looove oat bran! And you definitely paired it with awesome flavours. I’m almost out of PB2 so I’ll have to try this before I run out! Yess, so delicious! 🙂 Thanks for stopping by, Heather!